Spot Opportunities (Commercial Blog): Calling all Electrical Heroes! 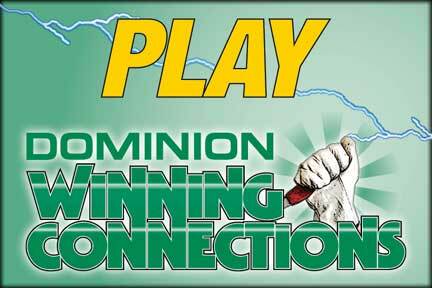 The Winning Connections program is an instant reward game and sweepstakes. You don’t need super powers to play, just a Dominion Electric Supply account. Sign up for the program at our Winning Connections Kiosk set up at each of our counters. Enter to Play. Play to Win! Restore the power and you could win an instant prize – useful and fun stuff like ball caps, work gloves and t-shirts. Instant win prizes range in value from $5 to $85! No matter if you win or lose, every time you play, you are entered in our Winning Connections Sweepstakes. Monthly sweepstake prizes are worth $200+! You could win great stuff like an overnight golf getaway for two, camping extravaganza package or valuable tools for the trade! Receive a FREE solar carabiner clip light just for signing up! Once you register, we’ll keep you up-to-date via mail, fax or email – your preference – no need to don a mask and cape. Prizes and promotions will change often, so keep coming back to see what is new that month. There’s nothing to buy – and no club card to keep track of – simply sign-up to make a winning connection with Dominion Electric Supply Company! Get started today. Stop by any of our eight area counter locations and visit our Winning Connections Kiosk, register and play to win. A thank you for all you do to make the world a better and safer place for all. .... a company promotion - but fun for all, I think. Enjoy!